Most people would think that Château Chalon is the name of property from which a wine comes. In fact, it is actually the name of an appellation, which most connoisseurs would agree is the pinnacle of Vin Jaune. Historically Chateau Chalon was viewed as being one of the great vineyards of France by writer Maurice Edmond Sailland, along with Coulée de Serrant, Le Montrachet, Château Grillet and Y’Quem. Additionally, the Emperor Napoleon was educated on the wine when sharing a drink at Johannisberg castle with Prince de Metternich. Napoleon declared "Here, you serve the best wine in the world". Hesitating, the prince finally said, "Sir, with all do respect, the best wine in the world is not from Johannisberg, but found in a small town in your empire, at Château-Chalon"
Its bowl-shaped plantings lie below a majestic chateau perched precariously upon a hill overlooking the vines. The vineyards (just 50 hectares) are farmed by nearly the same amount of producers. 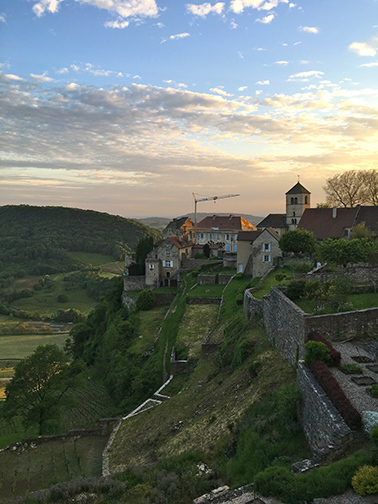 While most of the Jura produces Vin Jaune, Château Chalon is the most controlled production area with its own appellation. There are three quality checks annually, first before the harvest (when occasionally producers will agree that the grapes are of inferior quality and will not produce wine, like in 1974, 1980, 1984 and 2001), after the aging process and before bottling. Soils include blue and gray marl along with limestone outcrops higher up the hill. Vines lie between 250 and 400 meters altitude and face south and southwest. Vines along the slopes often reach 45 degree angles. Average production is about 35 hl/ha. The only grape permitted in Château Chalon is Savignin. Also known as Le Tature or Fromentin, its origin in not well known. It is closely related to the Klevener d'Heiligenstein grape which is cultivated in Alsace and is part of the Traminer family. Its thick skin makes it resistant to rot and allows it to be harvested late. Grapes in Château Chalon have to have at least 12% alcohol potential, which is higher than other vin jaune in the region. The grapes are hand-harvested in October, about two weeks after Chardonnay. At the end of fermentation, the wine is put into oak barrels for a period of six years and three months. The 228 litre barrels are put into dry cellars that fluctuate in temperature between summer and winter. During this time, the barrels are never topped up to compensate for evaporation, as is the practice with most wines in other winemaking areas. The wine develops a voile or veil of yeast just above the wine, which imparts a particular aroma and flavor to the aging wine. Wine legally must remain in the same barrel for 6 years and 3 months. Château Chalon is sold in a particular type of squat bottle known as a clavelin that contains only 620 ml, a slze chosen because during its 75 months of aging, this is the quanity of wine left from a liter that has not evaporated or been shared with the angels. Vin Jaune is often compared to sherry because of its nutty taste. However, Vin Jaune is not fortified like most sherry and must spend a full six years under the flor. It has a very particular taste, most usually green walnuts followed by tobacco, ginger and curry, a flavor that comes from the presence of soloton, a chemical compound that develops during the ageing process and is also found in Tokai wines from Hungary. Extremely powerful, an open bottle will fill a room with its aroma after ten minutes. They often taste better then next day or, in fact, the following week (after all, they have been exposed to air for years). Most producers say their wine will last for 50 years or more, and many of them have examples to back up this claim. Because it is such a unique wine, it is recommended to be consumed on its own, or perhaps with some walnuts or compté cheese. However, if one really wants to be a baller, a simple roast chicken along with a cream sauce containing chanterelles makes for an amazing combination. 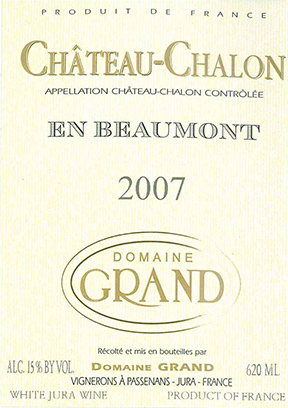 ​Domaine Grand makes Château Chalon from a small parcel called En Beaumonts. But they also make a full range of other wines. We just wanted to talk about Chateau Chalon first because it really is a most marvelous site and amazing wine that needs to be tasted at least once a year! The Grand family has been in the Pupillin region for over 300 years and farmed grapes for 7 generations. Until the mid-seventies, Lothain along with his wife Christine farmed just 2 hectares of vines, supplementing the families income with milk and assorted crops. By the mid-seventies, he began phasing out his reliance on cows and planted 10 hectares with vines. He studied winemaking in Beaune and then did some internships in Meursault and the Jura. Lothain’s two sons, Emmanuel, who had done an internship in Chile, and Sebastien took over the domaine at the beginning of the millennium, expanding their vineyards to nearly 24 hectares, with nearly half of that being chardonnay. In 2014, the brothers decided to split: Sebastien sold his vineyards and entered another profession, while Lothain parted with his part of the company as well. Now the domaine is comprised of nine and a half hectares of vines (7 in the Cotes du Jura, 2 in Cremant du Jura and .70 in Chateau Chalon), and run by Emmanuel and his wife Nathalie, a native of the Arbois region who also studied winemaking. 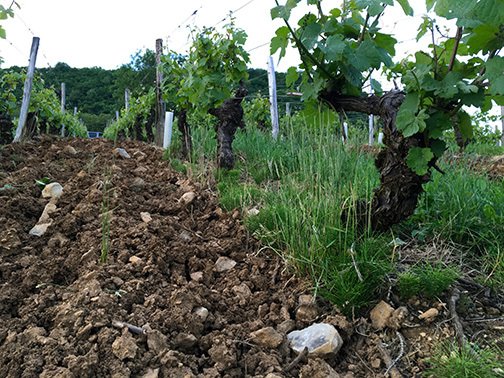 The smaller vineyard surface split between the communes of Saint Lothain, Passenans et Ménétru-le Vignoble permits the couple to focus more on the meticulous care of their vineyards in an effort to make the wines as pure as possible. They work sustainably; insecticides have not been used for 20 years and they have cut their spraying by more than 50% in the last five years. Grass is left between the vines. They make their own fertilizer with plants, oats and radishes during the summer and disperse it on the ground where it stays all winter long. Harvest is entirely by hand. Sulfur levels have also diminished in the cellar. Their philosophy, however, remains as before: to produce healthy grapes that will make fruity, round and characterful wines. 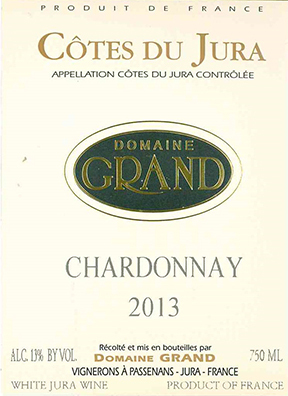 Domaine Grand Chardonnay: 30 to 50 year old vines grown on clay and limestone marl. The vineyard also contains Melon a Queue Rouge, a natural variation of Chardonnay whose stems turn red near harvest time. 1/3 of the blend is aged 12 to 18 months in two year old barrels from Meursault with some lees stiring. Tasting notes: This chardonnay is forward and full of bright chardonnay fruit, a touch of vanilla and good liveliness. Domaine Grand Chateau Chalon En Beaumont: Green walnuts, quince, lemon confit and a hint of curry. Tasting notes: Finishes dry and very long! Domaine Grand ​Poulsard: From 20 to 30-year old vines grown on marne, clay and limestone. Fermented foudre and tank for 6 months. Tasting notes: Its pale color leads to a mouth of light red fruit with a touch of vanilla. 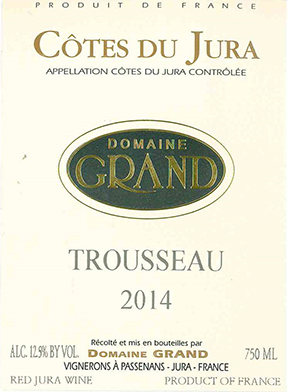 Domaine Grand Trousseau: Comes from clay, limestone and red marl from vines that are 15 to 30 years old. Short 7 day fermentation period. Aged in a combination of oak and stainless-steel tanks. Tasting notes: A fragrant, light bodied, very pale red with wild strawberry, bramble fruit and spice aromas plus succulent tangy summer berry flavors. 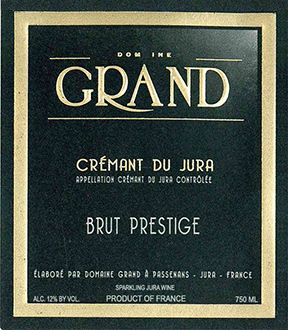 Domaine Grand Cremant du Jura: 100% Chardonnay from 10 to 30 year-old vines grown on clay and limestone mal. Fermented in stainless steel with malolactic fermentation. Aged for two years in foudres, then on its lees for 15 months. Finished with a dosage of 6 grams. Tasting notes: It shows apple and citrus fruit with a touch of Jurassic tonic. 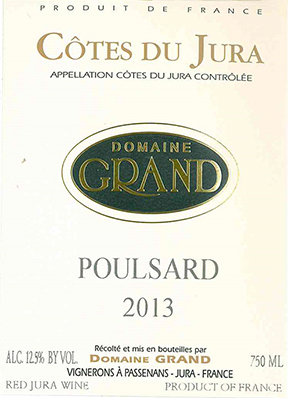 Domaine Grand Cremant du Jura 2010: 100% Chadonnay from 10 to 30 year-old vines. Aged in stainless-steel tanks. Aged on its lees for 36 months. Tasting notes: Deep, toasty flavors balanced beautifully by big baked apple notes. The flavor profile here is quite similar to Champagne, albeit without the underlying chalk notes. Tasty stuff! Domaine Grand Pinot Noir: The 20 to 40 year-old vines are grown on a clay and limestone slope. 100% destemming. Malolactic in barrel, aged in 3 year old casks. Tasting notes: Bright Pinot flavors backed up by bright acids. Lighter styled pinot, rather in the vein of Menetou Salon or Sancerre.